If you like animals then here is a description of the tiger which are a very nice looking creature to look at. Tigers are the largest cat species. Their body length reaches of up to 3.3 metres (11ft) and weighing up to 306kg (670ib). It is the third largest meat eater behind the polar bear and the brown bear. Its most recognizable feature is a pattern of dark vertical stripes on reddish – orange fur with lighter underside. In zoos, tigers have lived for 20 to 26 years. Depending on the native locale, tigers eat different kinds of animals, this can include antelope, deer, boars, and yaks as well as smaller prey such as hares, monkeys, and wild dogs. Sometimes not all the time they eat young elephants and rhinos. 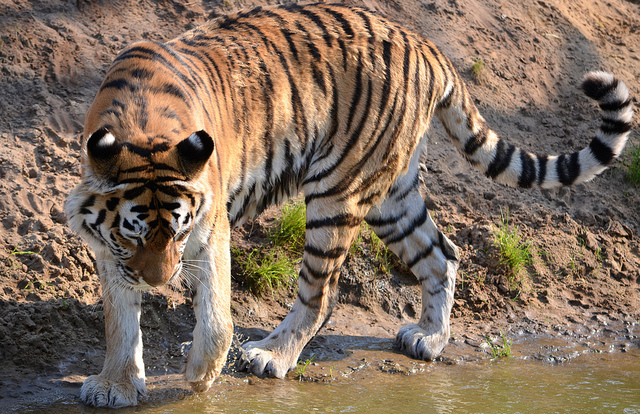 Tigers are also been seen to be scavengers in the wild. The countries that the tigers once used to ranged widely are across Asia, from turkey in the west to the eastern coast of Russia. Today, they ranged from the Siberian taiga to open grasslands and tropical mangrove swamps. The global population in the wild is estimated to number between 3,062 to 3,948 individuals, down from around 100,000 at the start of the 20th century. Tigers are among the most recognisable and popular of the world’s large animal species. Below is a quick video of how the tigers are in the wild and of a tiger hunting down and killing a wild Boar.